Ulefone Power 3 has been announced 10 months after the Ulefone Power 2 and 2 years after the Ulefone Power. The original device is one of the most successful smartphones of the brand, while its successor has not been able to reach its success. The Power 3 is here to correct this. It packs a large battery (6080 mAh) and the Helio P23 chipset, which in our reviews, has proven to be very power-efficient. In addition, the model follows the latest trend of offering a full-screen design with a huge display and reasonable resolution along with dual cameras - both on the front and back. It all sounds like quite a bang for your buck and our in-depth review is here to check which part of the whole is worth it and which is not. 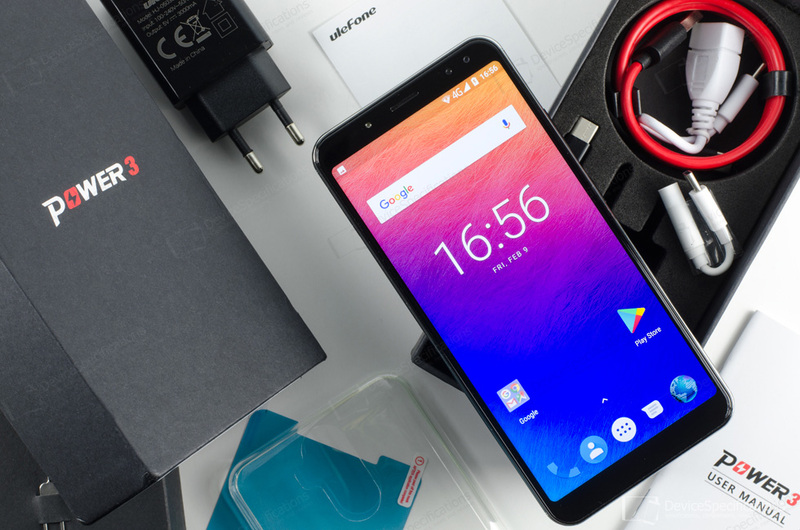 Ulefone Power 3 is adorned with a 6-inch in-cell IPS display with an FHD+ resolution (1080 x 2160 pixels) and a 2.5D curved Corning Gorilla Glass 4. It is coupled with a polycarbonate body. Performance-wise, the device relies on a MediaTek Helio P23 (MT6763V) chipset in its downgraded variant. This SoC uses TSMC's 16nm process and employs an octa-core CPU with four Cortex-A53 cores clocked at 2GHz and another quadruplet ticking at 1.5GHz. The graphics department is managed by a dual-core 700MHz Mali-G71 MP2 GPU with Vulkan API support. The chipset is combined with 6GB of LPDDR4X RAM, dual-channel, clocked at 1600MHz. The built-in memory is of the eMMC 5.1 type. Its capacity is 64GB and can be expanded with up to 256GB. The system-on-chip has a Cat. 7 modem and supports 2G GSM (850, 900, 1800, 1900 MHz), 3G WCDMA (900, 2100 MHz), and 4G LTE-FDD (800, 900, 1800, 2100, 2600 MHz) network bands. The wireless connectivity options of this model include dual-band Wi-Fi 802.11 a/b/g/n, Wi-Fi Hotspot, Wi-Fi Direct, Wi-Fi Display, and Bluetooth 4.1. Ulefone Power 3 is equipped with two cameras on the back and two on the front. The rear module includes a 16MP Samsung S5K3P3SX sensor, interpolated to 21MP and coupled with an f/2.0 lens, and a VGA GalaxyCore GC0310 auxiliary snapper, interpolated to 5MP. They are aided by a dual-tone LED flash and phase detection AF. The front-facing cameras include an 8MP OmniVision OV8856 sensor, interpolated to 13MP, combined with and an f/2.2 lens, and a 5MP auxiliary snapper - probably this is an interpolated VGA GalaxyCore GC0310 sensor, too. The front pair is combined with a selfie softlight. The device has a rear-mounted fingerprint sensor, a USB Type-C 2.0 port with OTG support and no 3.5 mm jack. It runs on Android 7.1.1 Nougat, upgradable to Android 8.1 Oreo. 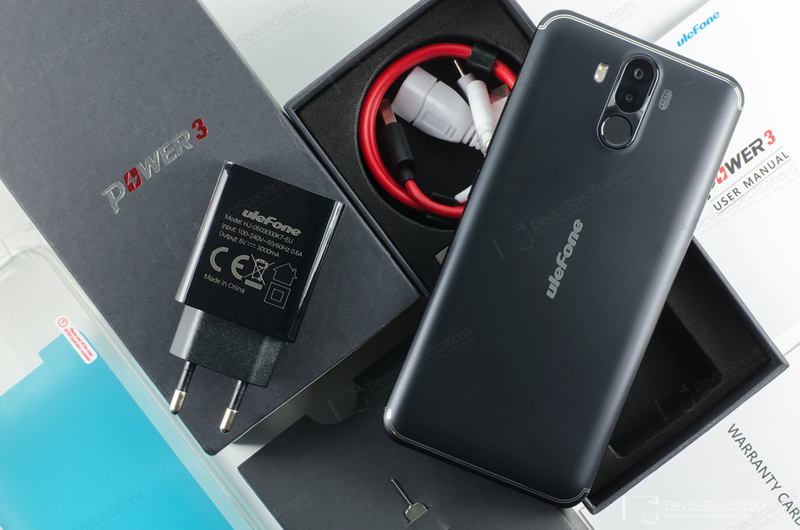 Complete Ulefone Power 3 specifications.